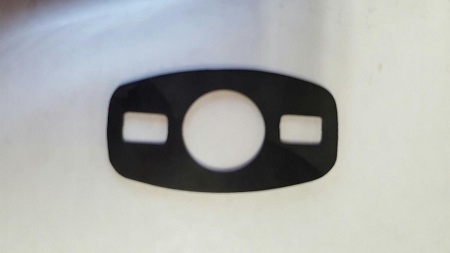 This is the gasket that best fits our L Handle and T Handle for trailer doors. The gasket is placed between the exterior trailer wall & the handle during installation,It's neater, eliminates the need for silicone or caulk and may help with corrosion. Looks professional. 2 3/8" L X 1 1/4" W. 7/8" diameter hole at center. Two elongated slots to fit either 1 1/2" or 1 3/4" screw centers. 1/32" thick neoprene material.